So - once again, with my latest iTunes update - 11.1 which was required for iOS 7 - I am at a loss for my fave radio stations via iTunes radio. I very much enjoy this feature of iTunes but it seems like every time I upgrade iTunes - it moves. You might recall the post for when I upgraded to iTunes 11. 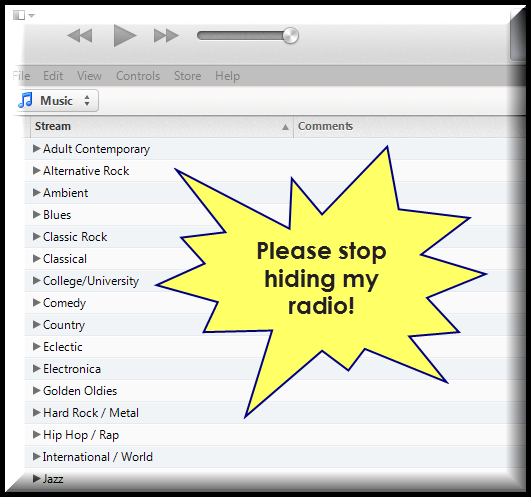 After the upgrade - I launched iTunes and saw the Radio option at the top - awesome! When I clicked on it however, it was not what I was expecting. What I found was a new radio thing where I could create my own stations - OK - cool - tried recreating my fave stations with some of the artists - ugh - not turning out right. 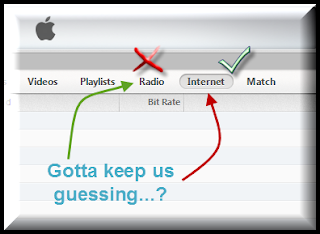 Look at the picture above - You will notice an option for both Radio and Internet - After my update - the Internet option was not there - just Radio - and that seems like the most logical choice doesn't it? After poking around in the menus for a while, I found the magic setting. 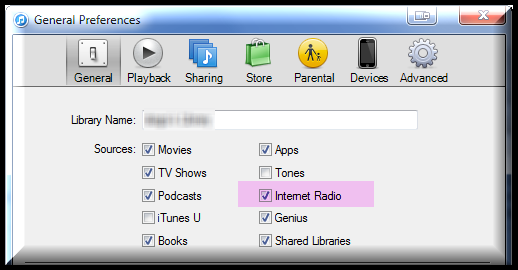 My Internet Radio option was unchecked. Notice that here it says Internet Radio and on the actual menu it just says Internet. At any rate, I checked the box and I had what I was looking for. Here is a video walk-through to help you find the setting.